"Do you know where my grandfather died and where they buried him?" Did you search your national sources ? Americans should try the American Battle Monuments Commission. For British soldiers try the Commonwealth War Graves Commission. For Australians try the Office of Australian War Graves. For Belgian soldiers try the (unofficial) Belgian War Graves-website. Very good too is the search engine of the "In Flanders Fields Museum". You can also order an CD-Rom. For French soldiers you should try the search engine of "Mémoires des Hommes". For Germans try the German War Graves Commission. For Canadians there is the database of the Canadian National Archives and also the Canadian Virtual War Memorial. New Zealand has the Heritage Affairs Commission. If your grandfather was prisoner-of-war you might try the British Ex-Prisoner of War Association. "I can't find him there." Sorry, then I can't help you. Millions of soldiers died. There are so many without a known grave. But maybe YOU, dear visitor, can help. On this page you will find calls from people, who seek assistance or sometimes just a bit of information. If you are able to help them, please send them an email. The small helmet was originally owned by Baron Von Bentheim and was presented to him by the Kaiser Wilhelm II. 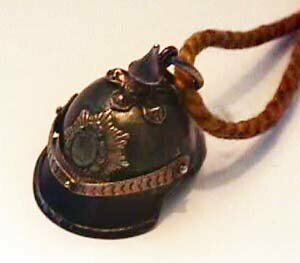 It was told that the Kaiser had these tiny helmets specially made and gave each of his men one to wear on their watch chain. The daughter of Baron Von Bentheim was the Baroness Gertrude Bentheim. The Baroness gave this helmet to my Great Aunt when she was 9 years of age in Bar Harbor, Maine. By this time the Baroness had become Gertrude Engel, the wife of Fritz Franz Engel. Fritz Engel was an artist and maintained a summer studio in Bar Harbor, Maine. It was told by Gertrude Engel that the helmet had been given to her Father by the Kaiser. On the underside inside the rim of the helmet is inscribed in German the word 'Geschutzt' which means protected or defended. If anyone can give me any information on this item it would be greatly appreciated. I hope the picture will be helpful. The detail of this little helmet is amazing with moving parts. The overall size of the helmet is about the size of a large cherry. 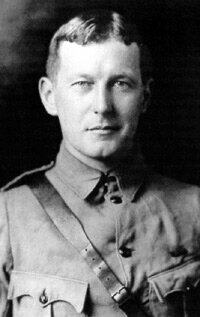 My Great Great Grandfather was Dr. John McCrae, who wrote the poem. I am looking for a copy of a picture or two, for my children to see and remember, but unfortunately all the photos from my relatives were given away to distant relatives who are so distant I don't even know who they are. The rest are in a museum here in Canada but I can only get a pamflet from them on him. Do you think I might be able to find some help here? My Grandfather, Mr Albert Ponton served throughout the war in The Buffs, The Royal East Kent Regiment. He survived the war. I know he served in France, he fought at Mons and at Ypers and in Salonica. I would like to find out more about his activities during World War 1. I know he signed on in 1914 at Findsbury Barracks, London EC1. How can I find out more? 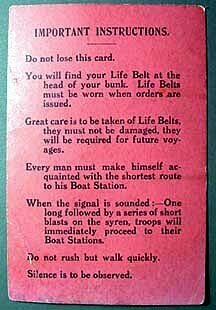 My father served in Italy in WW I. I have a ticket that I assume was issued for passage on a troop ship. One of the assigned areas was Glory Hole Aft. I am attaching two photos. One is of the front side of the ticket and the other the back side. 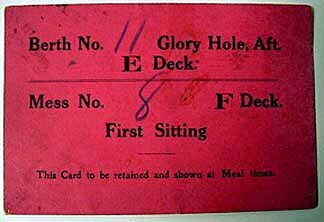 I am wondering what the designation 'Glory Hole' means and where on the ship, according to the ticket, my father was assigned. I have been researching my Great Grandfather, Clarence Victor Prew of the 57th A.I.F, No 3220, and his time in Flanders where he was killed on 26th September 1917, the 3rd Battle of Ypres. He was supposedly killed by a shell at 10.00 am on the morning of the 26th September, outside Glencorse Wood on the Advance on Polygon Wood. To date there has been no grave found, however I discovered in his Dossier that his death was witnessed by another soldier, an Prvt.M. T. Foot No 3259, 1st M.G B (Machine Gun Battalion) and reported to Prvt.H.G. Moore, No 3196, 57th A.I.F, who trained with him at Royal Park in Victoria/Australia, and who was in the 57th with him. During this battle, I believe the Australians advanced on to Polygon Wood and this ground was held. If this is so, would they have buried their dead and marked the graves? Would it be possible to locate his grave then? Did all the soldiers who were buried at that time in makeshift graves, remain in these marked graveyards, and if so after the war, were all these graveyards fenced off and kept as graveyards? My cousin told the family that she watched a video on the Great War in 1996-1997 and it showed items that had been recovered from the battlefields and placed in Museums or the like. There was a pocket watch with C. V. Prew inscribed on the back of it, that was found in the Flanders region. This would have been my Great Grandfather's. How would I be able to find out about this watch? 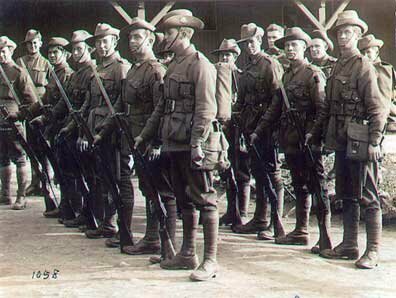 I have attached a photo, Clarence is the 2nd soldier from the right in the foreground, the shorter man. I do not know where this photo was taken, but as it belonged to my Great Grandmother, I would expect it was taken at Royal Park Training in Victoria (Australia) in November or December 1916, 8th reinforcements 57th Battalion, before leaving to England. If anyone can help me with information, please contact me. I was very interested in your site and the information that private cameras were banned during the Great War. 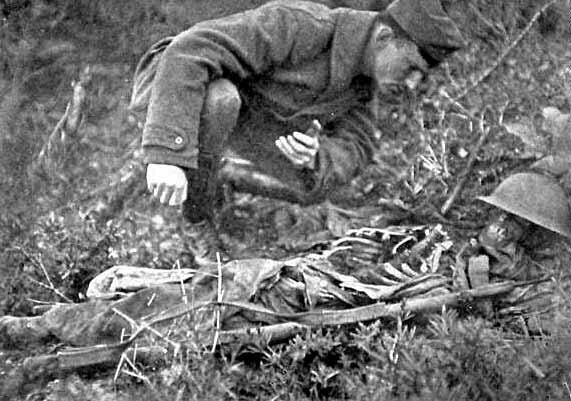 I have a photo of my uncle who died of injuries received in WW1. 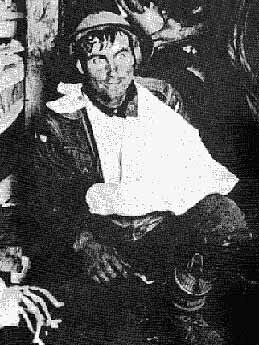 He is pictured with other soldiers standing in the mud. Behind them I think you can see the trench or a wooden walkway. They seem to have some sort of fur jackets over their uniforms. My uncle is the man in the centre of the photo with the white sheepskin jacket. There seems to be a total of seven men in the photo although the one of the left hand side cannot be seen. My uncle's name was Edwin Beale and was Lance Corporal B Company 1st London Regiment. He was sent home on the hospital ship St Andrews and was admitted to Beaucroft Red Cross Hospital, Colehill in Wimborne. He died, 22 years old, on the 9th September 1917, from (1) bullet wound of the pelvis, and (2) pelvic abscess and wounds received in active service in France. My mother tells me he was buried in Highgate Cemetery London with full military honours. I have no idea where the photo was taken. Maybe anyone else has? As a child I loved the gentle humane and subtly subversive humour of Barnsfather's cartoons. I believe the book was a collection of cartoons previously printed in news papers but I have not seen the book for more than 35 years so could easily be mistaken. I would love to obtain a copy, any help you can offer will be gratefully received. I just discovered this website tonight and bookmarked it. The MIDIS are great and I enjoyed playing them over and over! I had a Grandfather in WW1 but I am unsure of his unit, something called the blue-grey division? Any assistance would be appreciated. I was looking for more about the great war and I found your site. She is good, but I miss more information about the Belgian soldiers. My grandfather was killed on 11 november 1914 at Pervijze. His body was missed, so told me my grandmother. For years I am wondering where he could be buried, or whether he was really missed. Is there a list of all the missing soldiers? Could you help me? 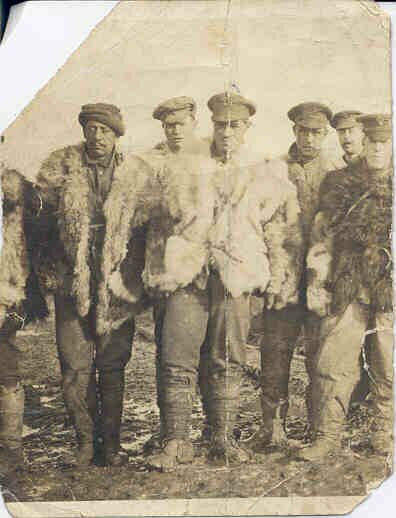 Do you have any photos or information on the Newfoundland Regiment of the British Army? My father fought in France in the war with the Newfoundland Regiment. I'm researching a thesis on the Wounded & Missing Enquiry Board, 1914-1918. It was set up under the auspices of the Australian Red Cross by Vera Deakin in Egypt in 1915 and then she ran the London office. I was wondering if you have come across any information on this organisation (or could point me to a useful contact)? I am trying to find some information on a friends grandad. His name was Herbert Page and he died in the Battle of Passchendale. His name is inscripted on the Menin Gate and we would like to find out if it is definately there. Do you have the answers and any other info at hand regarding this man? I am doing a fictional history story for an English/Social Studies project in school. I was wondering if you had any information about spies, because my character is an American spy. Also, if you have any photographs or pictures you could send me of women who helped out on the fronts in uniform (ie: women who were ambulance drivers, nurses, etc.) Thank you very much for your help! I am looking for the term used that described the put down of the French army revolt during WW1. I believe that the French army officer corp. at various company's were lined up and every tenth man was shot. If you could help me I would greatly appreciate it. I am currently researching all aspects of 'Trench Art' - the metal, wood, bone variety - not paintings or drawings. One aspect of this study is to investigate the trade in this material in antiques markets, militaia fairs, ordinary shops, and auction rooms in U.K., France and Belgium. I will be visiting the old Western Front many times over the next years and would be grateful for any other relevant info, gossip, tips or contacts you might have. Do you know who the man in the shell shocked photo is? My great uncle was Master Sergeant Michael Burke and he served in WW1. I know he was shell shocked during the war. If you could help me find some information on him I would greatly appreciate it. I am trying to locate German Naval records for World War 1. On Jan 15 1918 or Jan 15 1915 German submarine sunk a Newfoundland Schooner enroute to Seville Spain from St. John's Newfoundland. Can you advise how I might find this information. The daughter of the Newfoundland Captain who is now nearly 90 years old, is trying to find some particulars about her father. Is there a way I can find out what kind of fashions were in style in the WW1 time period? Thank you for posting these pictures. I work as a psychologist and frequently am involved with individuals who have had traumatic experiences of war. Unfortunately the descriptions of war within western culture are unreal/romantic and our written and verbal language denies the experiences of such people... isolating them. I am presenting a seminar on the nature of post-trauma stress and have been seeking un-glamorised and - as you point out - previously sensored images of the nature and horror of war. This to illustrate our conscious ignorance of these experiences. If there are any other photo's you think may be of help, please e-mail me. I would like some information on a box I have. I think it was made to hold cigarets? It is hand made out of tin with German carving. It say ERINNERUNG, GENSCHAFT, AN DIE GEFAN-, DIJON-PERGNY, 1914, "WL". The box is all engraved with flags, a gun, wheet and a nut tree branch? It has a locking devise that is made out of a old ruler and is in very fine shape! I would like to know more information on this piece. I'm doing some research on the Histories of the 9th and 12th Lancers during the Great War 1914-18, epecially the battles between them and the 1st and 2nd Prussian Guard Dragoons at Montcel and Moy. Is there any chance you have some Bibliography or some web addresses that could help me out? I am completing a thesis on European artists and photographers (professional and amateur) in the Great War, concentrating on views of the trenches. Without doubt, your website is the most comprehensive and interesting one I have come across. I have discovered a number of British artists and photographers but have little information about French, Dutch and Belgium ones. I was particularly intrigued by the works of Francois Flameng & Raymond Devereux, when I visited Paris recently. I have also an interest in the work of Frank Brangwyn who I believe was born in Bruges. If you can provide any information about this subject and/or pictures, photographs, I would be very grateful.